Building Signs: Having signs on your building such as projecting signs or channel letters can easily make a statement about your business. On-the-Go Marketing: Vehicle wraps and vehicle lettering are a great way to effortlessly get your business’ name out in the open anytime, anywhere. Post Signs: Post signs can come in a range of sizes and shapes and do a wonderful job of making others aware of your business. Temporary Signs: Temporary signs such as A-frame (sandwich board) signs are a fantastic way to make passersby aware of your business’ current events, sales and promotions, and at a fraction of the price of a permanent sign. Banners: Brightly colored, bold, and fun in nature, banners get your point across easily while being portable, flexible, durable, and reusable. Decals: There is plenty of room for free-thinking when it comes to decals. Create your own design and put them anywhere you want. LED Message Centers: Perfect for any business or organization, LED Message Centers are a highly versatile way to get your message out to the public in a bold way. 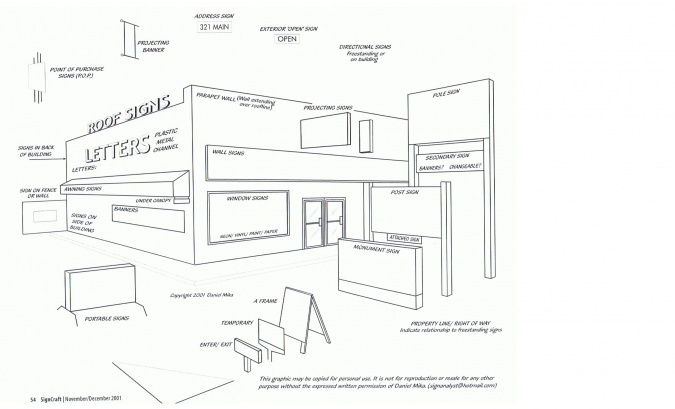 Use this diagram as a reference to decide what works best for your sign needs! Click here to see enlarged version of diagram.